MEDI-TRACE™ 530 Series Foam : Balego & Associates Inc. - BalegoOnline.org, Providing the Products You Want and the Services You Need Since 1984. MEDI-TRACE™ 530 series electrodes are designed for superior performance including adult Stress, Holter and Diaphoretic applications. 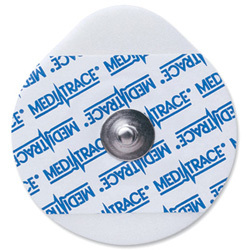 Utilizing a highly aggressive adhesive the MEDI-TRACE™ 530 electrode is appropriate for the most challenging of monitoring environments. The high quality foam substrate conforms easily to the skin to ensure electrical contact for consistent tracings. The patented conductive adhesive hydrogel provides additional adhesion, leaves no messy residue to clean up and is designed to stay fresh up to 45 days out of the package. There currently are 1405 guests online.